Duy Masuno was born in Vietnam. When she was a teenager, her mother asked if she wanted to study abroad. Duy jumped at the opportunity. She moved to Los Angeles, where she completed high school. When family in the Bay Area told her mother that there was a community college right next to their home, she decided to give Contra Costa College’s Business Administration program a try. An internship in that program changed her life. She hated it. It turned out that she didn’t want to become a business administrator at all. She was still deciding what she wanted to do instead, when a month-long trip back to Vietnam forced her to try some creative scheduling. Online and short-term classes were her only options that semester. But what Duy came to love about biotechnology is the diversity of options it presents. With a change of major, Duy suddenly found herself surrounded by people who shared her interests and values. She credits the Center for Science Excellence for helping her through everything from choosing classes to transferring to a four-year school. She also found a new mentor in a USDA program she connected with through the CSE. In 2015, Duy graduated with associate degrees in biotechnology, chemistry, mathematics and science, economics, and business administration. (She only had one or two classes left to complete the last two, so she decided to just go for it.) In 2017, she graduated from UC Berkeley. 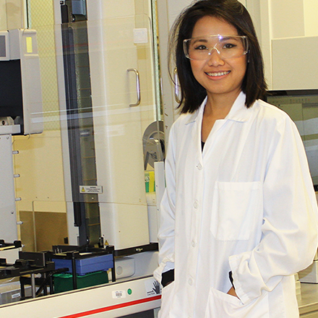 Duy just returned from an internship at a molecular genetics lab at Osaka University in Japan, where her work involved DNA replication.